Home / How Does a Water Fire Extinguisher Work? Water fire extinguishers are designed differently than other fire extinguisher types, so I did a little research. A water fire extinguisher is designed to expel water to cool down or extinguish the fire. When the tamper seal is broken, the safety pin pulled out, and the lever squeezed, it forces a pointed rod within the valve assembly downward to puncture a canister containing high-pressure gas. The gas is released into the cylindrical tank, forcing the water downward. The water is then channeled under pressure into a tube that runs up the inside of the fire extinguisher tank to the valve assembly and out the hose. 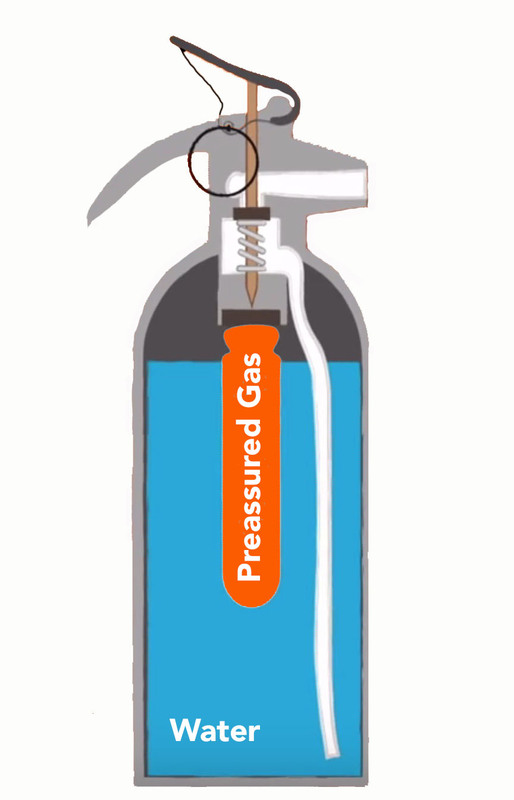 The pressure from the gas forces the water out of the fire extinguisher with enough propulsion to extinguish the fire from a safety distance of 4-6 feet. Like all fire extinguishers, there is a tamper seal that is wrapped around the ring or pin on the handle. The tamper seal prevents the fire extinguisher from being discharged accidentally. Inspectors evaluate the tamper seal to determine if the extinguisher has been used or not. If the tamper-seal is broken or missing, the inspector will know the extinguisher needs to be checked and/or serviced. Inside the steel cylindrical tank is a canister containing a high-pressure gas. The remainder of the extinguisher is filled with water. Inside the tank, a vertical tube extends the length of the tank and connects with the valve assembly. From here it leads to the outside nozzle where the water will be expelled to extinguish the fire. To learn more about the parts of a fire extinguisher read our other article titled, “Parts and Components of a Fire Extinguisher”. The steps to operating a fire extinguisher is simple and easy to understand, yet people tend to panic when they are confronted with a fire in the home or work place and spray the extinguishing agent ineffectively at the fire, resulting in the fire not being extinguished. If you follow these simple steps when confronted with a fire, you’ll be much more effective against fighting. For more information about the P.A.S.S. technic, please read our article titled, “How to Operate a Fire Extinguisher”. For What Class of Fire is a Water Extinguishers Used? The basic chemical reaction to produce fire is the same, (Oxygen + Heat + Fuel = Fire Reaction). However, each fire classification is different with its own unique characteristic and fuel source. This requires that you use a fire extinguisher specifically designed to extinguish a specific type of fire. 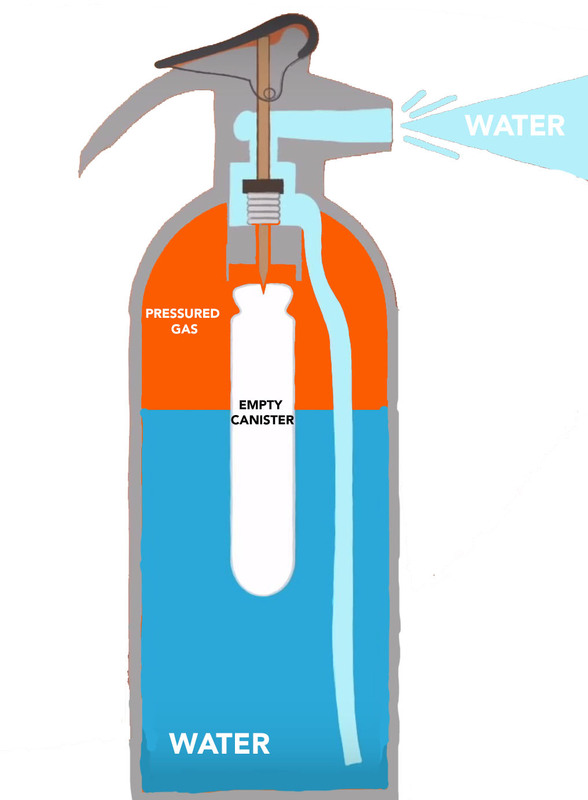 Water extinguishers are used on Class A Fires (Combustibles such as wood, paper, cloth, trash, and plastics) and extinguishes a fire by removing its heat component. When the heat is removed, the chemical reaction for fire is no longer viable and the fire is extinguished. Which Fire Extinguisher Should I Purchase? There are a variety of factors to account for when purchasing a fire extinguisher. 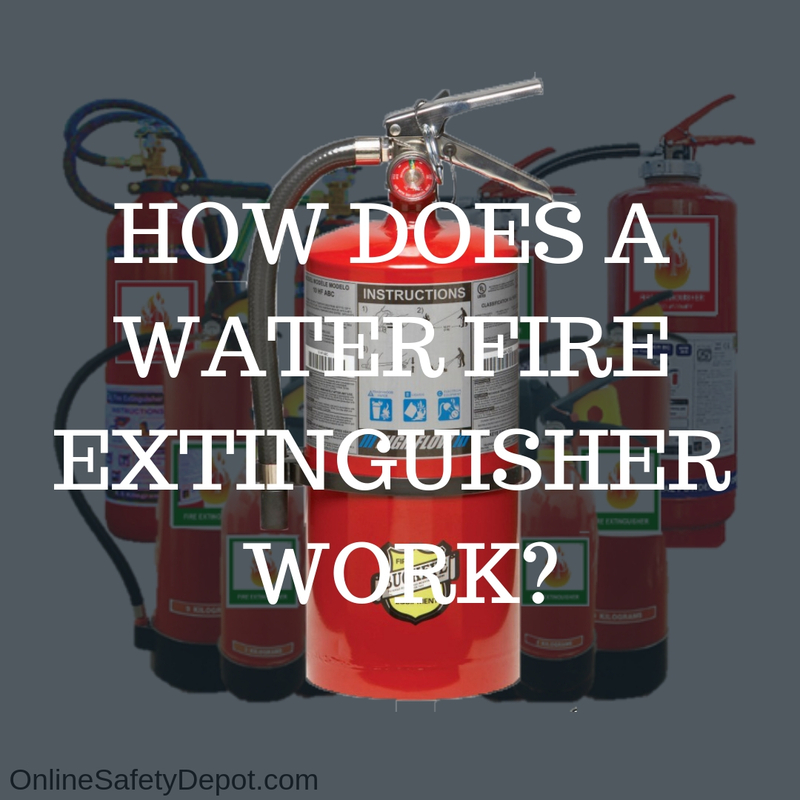 Water Fire Extinguishers are just one type of Extinguisher. The main types of fire extinguishers are: Class ABC, Class K, Class Purple K, Halotron, Carbon Dioxide, Water and Foam. Consider the following questions to help you determine which one best fits your needs. OSHA requires that fire extinguishers used in the workplace meet appropriate standards of size/weight, extinguishing agent, and are placed in accessible locations with proper signs to identify them. Fire extinguishers that are in the home are not under OSHA guidelines and as such, the rules, regulations and laws do not apply as they do in a workplace environment. Fires that originate in a computer server room would more than likely be an electrical fire, whereas a large industrial kitchen fire would most likely be fueled with oil or grease used for cooking. Fires that occur in the home may have a fuel source of wood/paper, electrical from a faulty outlet or grease from cooking in the kitchen. As a result, you would want to have a Class ABC fire extinguisher to combat all three potential fire types as it is able to extinguish all of them. Would you rather have a small 5-pound fire extinguisher for a large 3,000 sq ft warehouse or a large 150-pound wheeled fire extinguisher? Likewise, I’m sure my wife would rather have a small 5-pound fire extinguisher hanging on the wall than have a large wheeled fire extinguisher sitting next to the fridge. Being aware of the space or area the fire extinguisher will need to combat a fire is extremely important. A 10-pound fire extinguisher will expel sufficient agent to cover roughly 80- sq ft, where as a 150-pound fire extinguisher will cover approximately 240 sq ft. While portable fire extinguishers are just that – portable – there is a difference in how easy it is to use a 5-pound fire extinguisher and a 30-pound fire extinguisher. Additionally, when you buy a 5, 20, or 30-pound fire extinguisher, you’re really buying a fire extinguisher that has 5, 20 or 30 pounds of extinguishing agent. You also need to account for the weight of the cylindrical tank and it valve assembly features. Because of the differences in the portable fire extinguishers, their weights and their intended uses, it is just as important to account for who may use the fire extinguisher and their individual capabilities to effectively handle the size and weight of the extinguisher. When Should You Not Use Water Fire Extinguishers? If you use a water fire extinguisher on a Class B fire (flammable liquid of gas or paint, flammable gases, such as propane or butane) the discharge force could spread the flammable liquid or gas enlarging the fire. As the denser and heavier water hits the oil it displaces it and sends drops of burning oil flying, causing the fire to spread much more rapidly rather than extinguishing it. The best types of fire extinguishers to use on a Class B fire are ABC fire extinguishers Halotron fire extinguishers and Purple K fire extinguishers. Water fire extinguishers are also not suited for Class C fires (electrical equipment such as motors or kitchen appliances). Water conducts electricity. If you have a Class C fire, and you attempt to use water to extinguish it, you’ll end up getting shocked which can result in injury or death. The best types of fire extinguishers to use on an electrical fire are ABC fire extinguishers, Carbon Dioxide fire extinguishers and Purple K fire extinguishers. Water fire extinguishers are extremely easy to use and highly effective on Class A fires. However, when purchasing a fire extinguisher for home, office or warehouse, there are a lot of different factors to consider to ensure that you and others around you are safe to use the fire extinguisher with the fire it will be extinguishing. Check out our resource page for more fire safety, construction safety and other related articles.